Whitney Pesek was 13 years old when she noticed her vision mysteriously turning blurry, sharp edges becoming soft. After a battery of tests she was diagnosed with macular degeneration, a condition that causes loss in the center of the field of vision. Despite her accelerating condition, a malady which she rarely discussed with others, Whitney discovered climbing and fell down the rabbit hole of obsession. 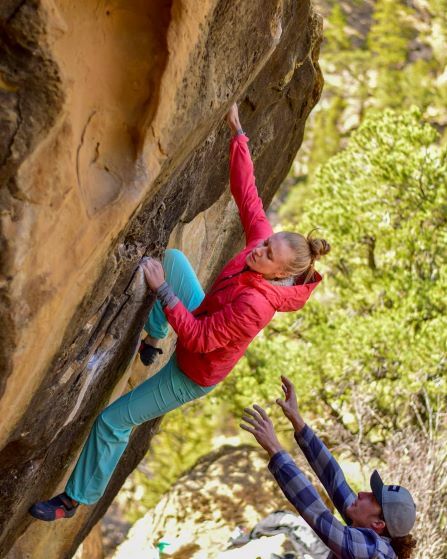 After years of roping up and cruising boulderfields, she discovered a community of adaptive climbers she had been entirely oblivious to. A couple months later she stood atop the podium at USA Nationals. Shortly thereafter she and her caller, fiance Sean Spring, were walking the streets of the legendary Innsbruck, Austria for the 2018 World Championships. By the time they boarded the plane for home, Whitney had both a silver medal draped around her neck and a new community of support, psyche, and passion. Buckle up for this one. Whitney’s is a story of humble perseverance, discovery, and a testament to how climbing can augment a stubborn drive to continue doing what you love against all odds. Thanks again to Ryne Doughty for the lovely tunes.